Cities continue to increase in size because people want to live close to their work, but it also makes cities the core center of high resource usage and pollution. Vicious cycles only make cities more unhealthy, which makes it important to redefine the value and the function of the buildings in the city. V4 Housing designed micro-collective housing units consisting of different prototypes that combined four vertical recycling systems, not only to provide for better living space but also to improve the environment of the city. 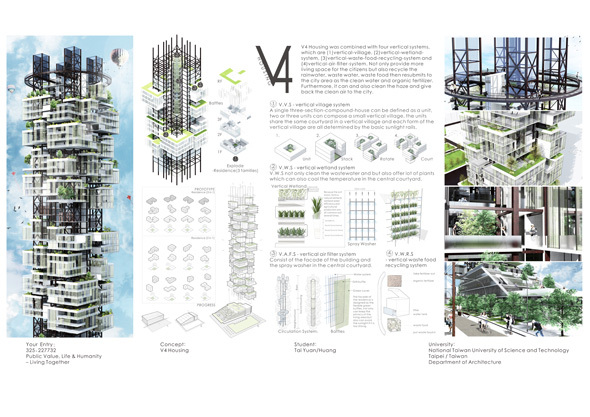 "V4″ housing was combined with four vertical systems, which are (1)vertical-village, (2)vertical-wetland-system, (3)vertical-waste-food-recycling-system and (4)vertical-air-filter-system. Not only provide more living space for the citizens but also recycle the rainwater, waste water, waste food then resubmits to the city area as the clean water and organic fertilizer. Furthermore, it can and also clean the haze and give back the clean air to the city. 登入 | 58 queries. 0.105 seconds.